We’ve reviewed several smart plugs over the years, and we keep stumbling upon the Etekcity smart plug. With its super affordable price and its high Amazon reviews, we finally had to see just how reliable it is for making small appliances smart. We tested it for our Etekcity smart plug review and overall, we liked what we found. Setting up the Etekcity outlet was standard, and we didn’t run into any issues along the way. Follow the simple instructions included in the small booklet, by downloading the VeSync app, plugging in your outlet, and following the instructions in the app to connect the outlet. During set up, you can distinguish the outlets with unique names and photos of each. If you run into issues, you’ll want to make sure your outlet is within 164 feet visible range of your router. In addition, these outlets only work on 2.4GHz WiFi networks. There are some helpful troubleshooting tips included, and you can call the support hotline on weekdays. We tested the outlet with a box fan so that we could schedule it, control it remotely, and find out its energy usage. Important note: your fan or other appliance needs to be switched “on” to work. For example, I hit On in the app, then turned the fan on low. From there, I kept the fan manually switched on and only used the app to turn the switch on and off. This is the same with all smart outlets, but important for new users to understand. Once it was plugged in and set up for our Etekcity smart plug review, the smart plug blended in nicely. 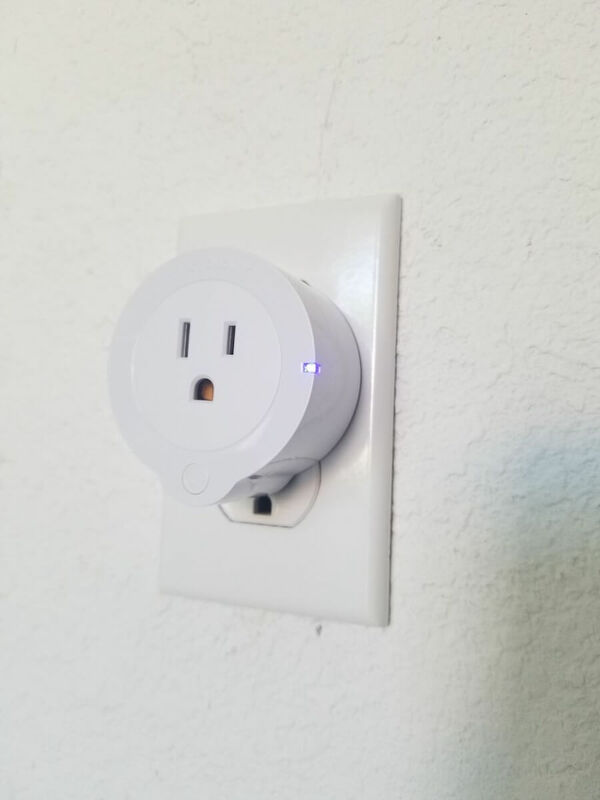 Similar to the other smart plugs we’ve tested, this one is all white, likely to help in blend in with a traditional outlet cover. 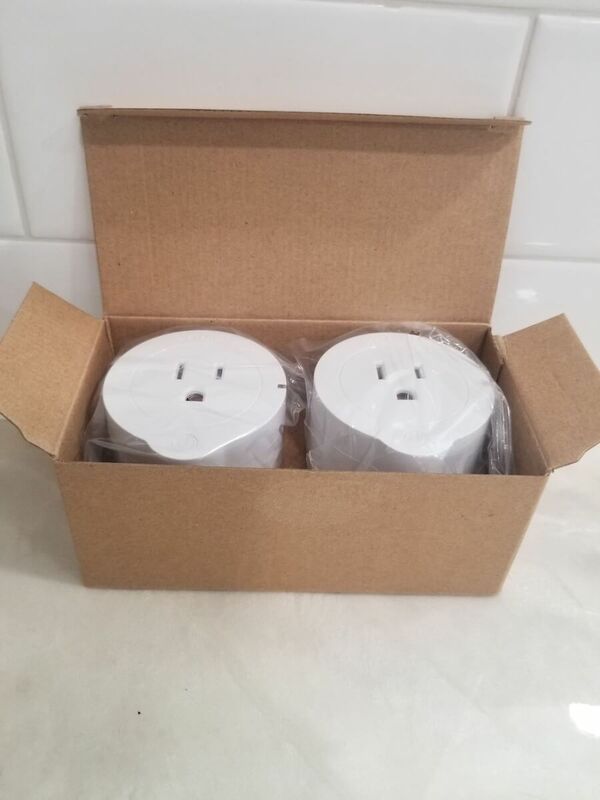 The biggest issue here is its size— the plug is barely too large so that it covers up the bottom outlet, taking up both spaces so that you can’t use the bottom one. 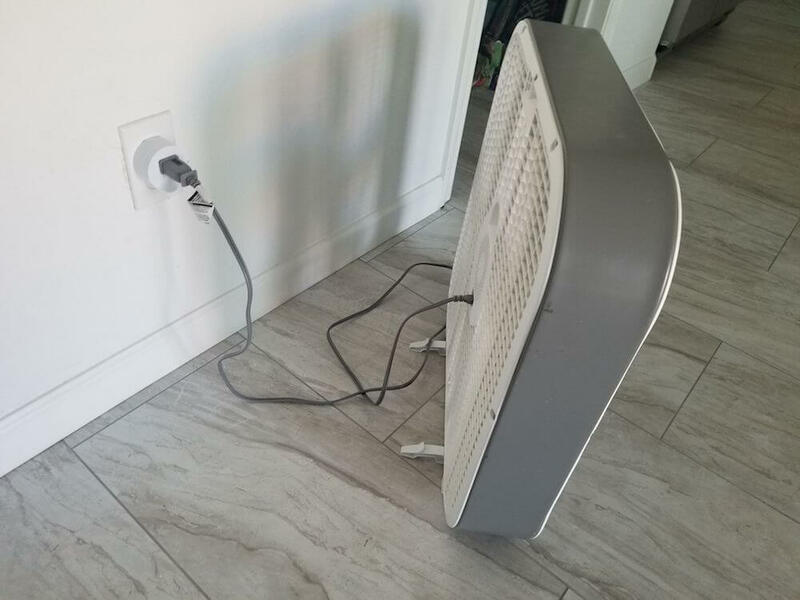 The obvious solution is the plug in the Etekcity outlet on the bottom, to free up the top outlet, but this is still something you may need to keep in mind for your set up since you can’t use two Etekcity plugs on one outlet. Etekcity’s outlet has a small button near the bottom for manually controlling the device plugged into it. The button also works as a reset if your plug needs to be reconnected manually. There’s also a status light on the right side of the plug to help you see when it’s connected to the app. While their design is minimalist and basic, it gets the job done and keeps the price down. There is a 1 year warranty for the outlets. The VeSync app, which controls your Etekcity outlets, works well and has a nice design compared to other more basic apps. For example, if you press the power button in the app to turn the switch on or off, it changes colors, giving it the feeling that you’ve pressed a real button. I tested the scheduling and timer functionality for this Etekcity smart plug review, and both worked perfectly and were easy to set up. There is also an away mode that you can schedule to give the appearance that you’re home while you are working or on vacation. You can receive notifications for Etekcity’s outlet if you want to be alerted whenever your device is turned on or off. One strong selling feature of Etekcity’s outlets is that it tracks energy usage to let you know how much this appliance is costing you per month, displayed on a chart to track usage over time. With WeMo, this is a much more advanced feature that only comes with their premium outlets. Energy Saving mode, which turns off the device after you’ve spent a certain amount. Input your cost per kWh (you can find this on your utility bill), then input the maximum amount you want to spend on that device. The plug calculates how much it cost you and turns the device off when the max cost is reached. Power protection. To prevent a power surge from destroying your appliance, you can have the device shut off automatically if it goes over the set wattage. Share device. Within the app, you can easily invite access your outlet by sharing access with family and friends. The app is easy to navigate and reliable, without any crashes during my Etekcity smart plug review. Within the app under the More tab, you’ll see options to Link to Alexa or Google Assistant. These offer instructions for connecting your outlets with either assistant. I tested mine with Alexa, although Google Assistant has similar steps to get it working. Once I opened the Alexa app, searched for the VeSync skill, enabled it, and logged in with my Vesync credentials, it was all linked up successfully. Then it was a matter of having Alexa run through its Discover Devices menu. Whatever you named your device is what will appear in Alexa. I simply named mine “Fan,” so that was the name for Alexa to control it, but since I have other fans around the house that I control (thanks to my BOND smart fan controller), I renamed it within the Alexa app to Kitchen Fan so that it would be more specific. After that, I was able to simply say “Alexa, turn on kitchen fan” and it worked instantly. Two of Etekcity’s biggest competitors are WeMo and TP-Link. These both offer updated mini smart plugs that are smaller and only take up one plug on the outlet. 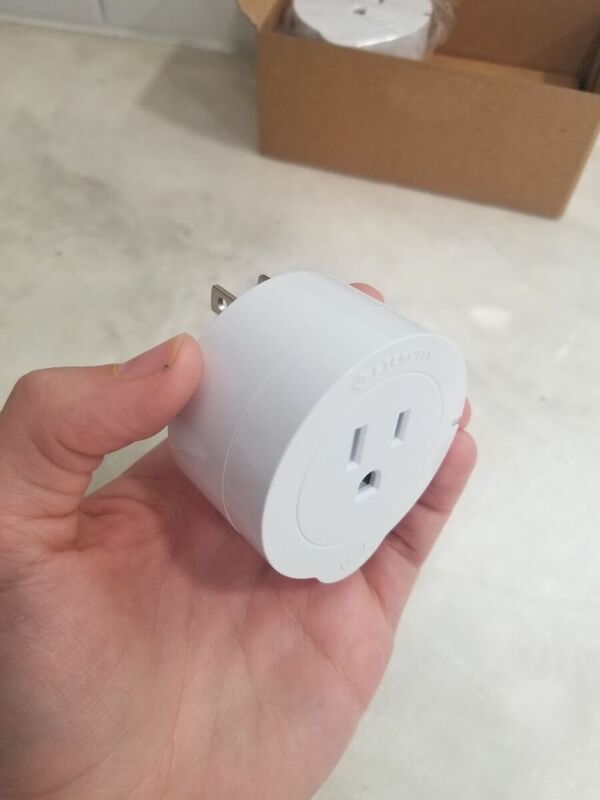 However, their updated design will cost you a little more per outlet than Etekcity’s outlets, and the mini versions don’t offer energy monitoring. The other big advantage of WeMo and TP-Link is their smart home compatibility. Both smart plugs work with IFTTT and Nest. 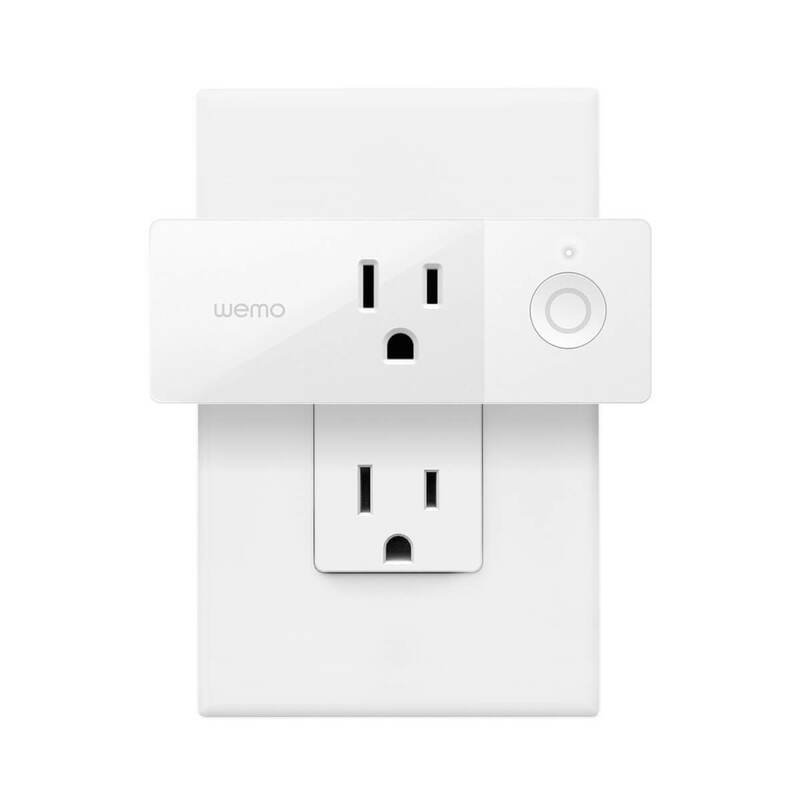 WeMo also offers a separate HomeKit bridge for connecting your smart plugs to Siri. For more details, check out our comparison of WeMo vs TP-Link. Another alternative worth mentioning is Etekcity’s larger remote-controlled plugs. These are cheaper, though only controlled by a remote, not WiFi. There is still a workaround for connecting them to your Internet: if you purchase these in conjunction with the Hook smart home hub, which uses the remote control’s frequency to connect to the hub and make all of the outlets smart. 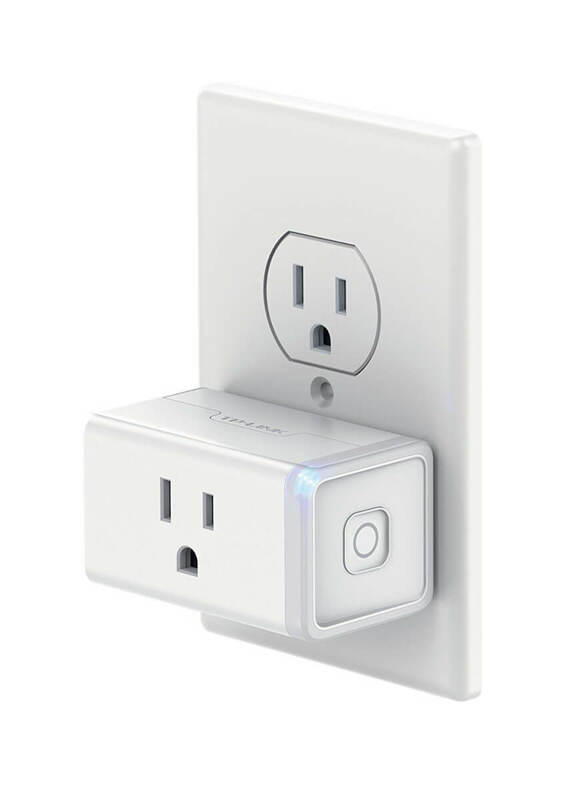 If you are wanting a house full of smart outlets, this is probably your most affordable option. In the end, the pros outweigh the cons in this Etekcity smart plug review. The outlets offer excellent features to encourage you to use less energy, while still working with Alexa and Google. These are a good option if you are looking for an affordable smart plug that still packs in all the features you would need.